With summer pushing the mercury levels higher, it is the right time to upgrade your AC or buy a new one to stay cool. Since the cost of air conditioners can run into several thousand, you may have to plan your finances well so as not to overstep your budget. But fret not, with all the summer offers to go on, you can make considerable savings! Further, by purchasing your AC on EMIs, you can avoid the hassles of using a credit card while staying within the budget. Better still, make your purchase even more affordable by shopping for an AC on No Cost EMI from the Bajaj Finserv EMI Network. If you buy now, when the Summer Sale is on, you can bag yourself lucrative offers. If you shop for an AC priced at of Rs.20,000 between 1st April to 30th June 2019 then you can get an Instant Credit of up to Rs.5,000 on your purchase. Moreover, if your AC purchase amounts to Rs.40,000 then you can get an Instant Credit of Rs.7,000. This will be credited to your Bajaj Finserv Wallet, and you can use it to make purchases in the future. What is the Bajaj Finserv EMI Network and why should you shop for your AC from here? The Bajaj Finserv EMI Network is an expansive online and offline shopping network where more than 60,000 vendors from over 1,300 cities offer a million products on sale. Here, you can choose and shop from a wide range of products spanning from electronics to kitchen appliances to clothes and more all on No Cost EMIs! When you shop for an AC on No Cost EMI from the EMI Network, you don’t have to pay a rupee over its purchase price to pay in easy installments without overshooting your monthly budget. Also, you can enjoy amazing offers, discounts, and cash back on your purchase. For easy repayment, you can pay the purchase price in EMIs starting at Rs.1,999 spanning from 3 to 24 months as per your convenience. So, save more by purchasing an AC on No Cost EMI. Here are the top ACs available on the EMI Network. Read the specifications and features to make the right choice. This AC is capable of strong dehumidification. Irrespective of whether you run your AC in cooling mode or keep it on in the fan mode throughout the day, you will always have the dehumidification feature working in order to circulate cool air all around the room. Courtesy of this feature you will never have to experience the harsh humidity in the air. Moreover, this feature cuts out the dampness in the air without affecting the room temperature. The 100% inner grooved copper make of this AC ensures a faster flow of refrigerant and prepares the AC to better resist corrosion. This, in turn, reduces maintenance cost and ensures long term durability. 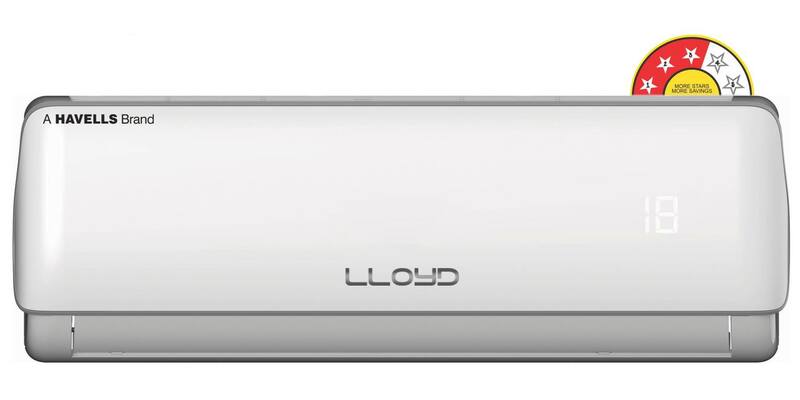 The two-way swing feature of Lloyd AC directs the air flow of your AC horizontally. The AC vane opens in the counter-clockwise direction to regulate this swing movement of cool air. The 4D express cooler for the AC ensures faster cooling in lesser time so you can enjoy instant coolness. The twin rotary compressor of the machine produces lesser noise when running, so your family can easily chat and sleep in the same room, noise-free! The DUAL Inverter Compressor of LG AC has a wider rotational frequency that results in high energy savings and higher speed cooling. This AC also runs noise-free and even running for a longer duration it does not register overheating problems. This AC has 100% copper with Ocean Black Protection to provide durability and protect the device against pollutants, salt, sand, and industrial smoke. The Turbo-Cool technology of this device cools the room even at 60°C. So whether you’re in Delhi or Rajasthan, you’ll still experience the chilling temperature of Jammu thanks to your Whirlpool AC. The 6th Sense Energy Saver technology of this AC automatically adjusts the cooling according to the room temperature and results in maximum energy savings. The 100% copper condenser ensures a long life of the air conditioner and less maintenance requirement, which results in lower utility bills. The DUAL Inverter Compressor of this appliance has a Varied Speed Dual Rotary Motor that helps in energy savings with high-speed cooling. The Mosquito Away technology keeps mosquitoes away and thus, eliminates mosquito-borne diseases. Select an AC based on your needs and head to the EMI Network to buy it. Check your pre-approved offer from Bajaj Finserv to view your customized deal and enjoy instant finance so you don’t have to bear the heat. Just enter a few basic details such as your name and contact number in order to access a range of deals. You are one step away from benefiting from customized EMI deals not only on electronic appliances but also on other financial services. Use these financing options to your credit and fund all your life needs with ease.